Vintage Silverplated Set Coffee/Tea Pot, Creamer, Sugar Bowl And Tray. Lovely Vintage Silverplated Set Coffee/Tea Pot, Creamer, Sugar Bowl And Tray. Size of the pot - about 7 inches height x 5 inches wide , 18 cm height x 12 cm wide. Size of the sugar bowl and cr eamer - about 4 inches height x 3 inc hes wide - 10cm height x 7 cm wide. Size of the tray - about 10 inches diameter - 25 cm diameter. Condition - handle of the pot is broken, got dents and scratches, will ne ed of cleaning. We have represented this item precisely and honestly to the best of our ability. We are not experts so please allow only the photos, not the text, to be your guide. I encourage you to look at my other auctions for a wide variety of items. Listing and template services provided by inkFrog Open. The item "Vintage Silverplated Set Coffee/Tea Pot, Creamer, Sugar Bowl And Tray" is in sale since Thursday, November 29, 2012. 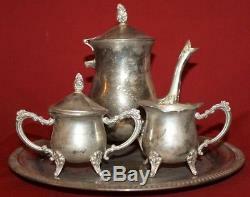 This item is in the category "Antiques\Silver\Silverplate\Tea/Coffee Pots & Sets". The seller is "radoleo2009" and is located in Sofia. This item can be shipped worldwide.